I was seeking to connect to my Windows 7 computer (that has a lot of disk space) from my Ubuntu Linux which is running on my Macbook laptop (via VMWare) which doesn’t have a lot of spare disk space and less than I needed for what I was doing. Far as I could tell everything was setup correctly, e.g. the file share in in Windows existing and was set to “share”, network working, etc. The Ubuntu machine was connecting correctly to a “Windows” share on my server (actually, Samba). Even turned off all firewalls to remove that as possible roadblock. When using Ubuntu’s “Connect to Server …” GUI available from the “Places” button, I was doing everything right, but Ubuntu kept re-prompting me for the Windows password. Over and Over. From a bit of creating Google work, found that the problem is something to do with “Windows Live Sign-in Assistant” and the recommendation was to un-install it. I have Windows Live running on the Windows 7 machine, but could not see how to uninstall only the Sign-in Assistant. Since Windows Live is not something I need on that machine, I simply un-installed the whole product. I received for Christmas one of those 3rd generation Kindle devices from Amazon. I like it. It’s a beautiful screen which is easy to read, the form factor and user interface is fine, and I like the idea of being able to hold so many books and documents in one place. I tend not to know what I will want to read so I like having lots of options available for when I do read. That means on trips I travel “heavy”. No longer. I’ve been using the Kindle software on a Mac and on my iPhone for some time. Accordingly, I’ve collected a few e-books. I’m now looking at getting a few more to round out the collection. Sadly, some of the books that I really want to get are available in USA from Amazon.com, but not available in UK from Amazon.co.uk. I’ve not done a rigorous review, but it looks like a large number of books available to USA customers are simply not offered to UK customers. That sort of ticks me off. They have a lot of snow and the airport continues to operate. Now we have a little bit of snow and airports close. Clearly the security regime is completely different. Yet they know of “hijacked planes” and bombs. 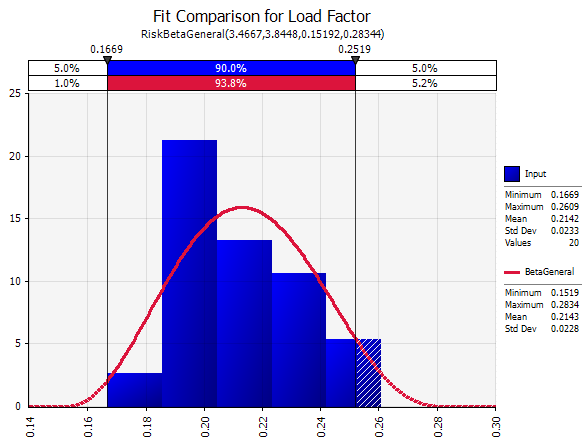 Perception of risk clearly different. Customer’s are treated well, and customers have high expectations of being treated well. See an intersesting forecast from USA-based AccuWeather for for the next 10 days. Cold. 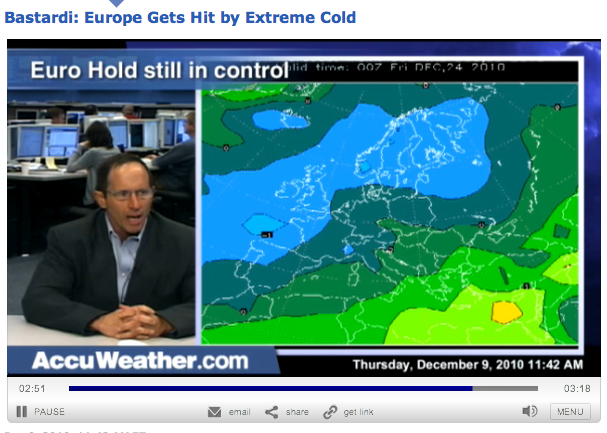 “Things are reallyy going to be nasty over the next 2-weeks”. I do hope the ice we now have on the ground will melt (possible) or be shoveled (unlikely) before the cold comes back. 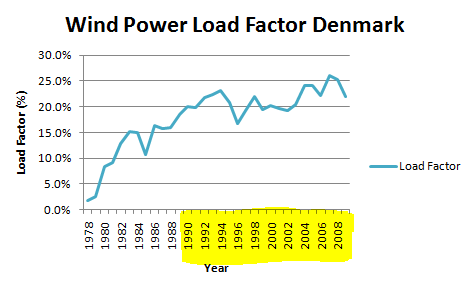 From a pointer from “Bernie” in comments at Bishop Hill’s web site, I took a look at the annual load factor for wind generation in Denmark based on data published at Wikipedia. I chose to do the analysis starting in 1990 as it appeared from the data that the first decade of wind power in Denmark was low–probably caused by the learning factor effect. The probability distribution is shown here, along with the raw data from Wikipedia. The mean over this 20 year period is about 21%. The trend is generally upward, but there is variation represented in the probability distribution. You are currently browsing the Musings on Interesting Things blog archives for December, 2010.